Self-inkingstamps have a built in ink pad that automatically inks the stamp die after each impression. You can make thousands of repetitive impressions without re-inking. These stamps can be easily re-inked. Our stamps are Ideal for Home, Office, School, Factory, Shop & more. ABC 2000 can also supply custom made pads for your Artistic Stamps, just sent us a B/W hard copy or computer file by email. 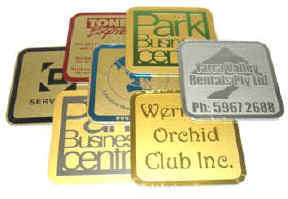 Over the years, we have created thousands of stamps from the drawings and graphics of our customers! Create or obtain a drawing, logo, graphic you want reproduced as a stamp. This must be black and white “print ready” artwork at 300dpi resolution. Print ready means that the file you send us should appear exactly as you want the stamp to look. Make sure you produce it onwhite paper with black ink. Erase all pencil sketch marks and white-out any extraneous marks you don’t want to appear. Your best bet is to send it to us the exact size you want the stamp to be. If you can’t, be sure to specify what size you want. Messy artwork, coloured inks, photographs or half-tones, large detailed drawings with lots of fine lines, large areas of black, and artwork more than 3 times the size of the finished stamp, image resolution below 250dpi. ABC 2000 , 21/13 Gateway Drive, Carrum Downs, Victoria 3201 Australia or sent by Email .